Surprisingly soulful food served with a side of craft cocktails. Clockwise from left: pork shoulder meatballs, grilled chicories salad, and braised beef cheek. For the past year or so, the restaurant at the corner of 49th Street and Telegraph Avenue has had something of an identity crisis. The prominent spot in Oakland's Temescal neighborhood had been home to Barlata, one of the city's better tapas bars, but last spring, the place reopened under new ownership as Grange Hall, a combination cocktail bar and upscale burger joint that lasted less than five months before its owners shut it down and tried to figure out a new concept. It became a popup that seemed to serve mostly Asian-inspired dishes to go with those cocktails until, earlier this fall, the popup became "permanent" — but then the food wasn't Asian anymore. For a while, I put off dining at the latest iteration because I wasn't sure exactly what it was supposed to be, and whether it was meant to stick around for the long haul. Part of the problem is the confusing name, which, if it rings any bells at all, might appear to be an odd reference to coal production, or the controversial Iraq War-era military contracting firm. Instead, "Blackwater Station" is a rather obscure allusion to the name of a gas station and speakeasy operated by Prohibition-period moonshiners, as portrayed in the 2012 film Lawless, explained bar manager Jason Huffman, who is a partner in the business along with majority owner Jonathan Moon. What the name indicates, in part, is that Blackwater Station is more of a craft cocktail bar than anything else — the kind of place that makes an assortment of elixirs, tinctures, and sodas in-house, and serves booze-heavy concoctions with long lists of fancy ingredients, but also served me a very solid and decidedly non-fussy variation on a rum and Coke. Jason Huffman stirs a cocktail. Even as a bar, the place is a little bit hard to pin down, with its relatively tiny physical bar counter and preponderance of two-tops. And if the place is meant to function as more of a sit-down restaurant, it's notable, then, that during both my visits, there seemed to be only one server working the floor (who, it should be noted, held down the fort reasonably well). 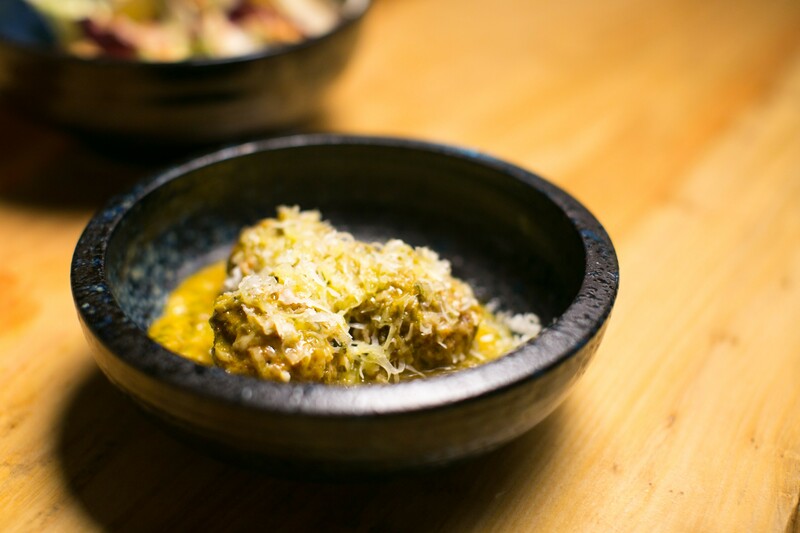 But any doubts you might have about the bar's worthiness as a food destination will be put to rest the moment you take a bite into one of chef Jonathan De La Torre's pork shoulder meatballs — the best of several very good small plates I tried on the concise but muscular menu. It seems trite to say that the meatballs, whose 30-percent fat content was boosted by an infusion of bacon fat, were as soft as clouds or pillows, and yet: You can order meatballs at every Italian joint in town, and you still might not find another version that's as light and as loaded with porcine savoriness. The sauce was just as notable: a "brassicas bolognese" made by braising the puréed bits of broccoli and cauliflower stems and the Brussels sprout parts left over from another dish for several hours in white wine and olive oil, until the vegetables practically melt into a sauce so silky and flavor-packed, you'd be hard-pressed to tell apart from a traditional meat-based "bolognese." You don't expect a cocktail bar that has this kind of modern, sophisticated ethos — with its requisite elements of taxidermy and reclaimed lumber — to serve "homey" or "soulful" food. Or at least I don't. But I wouldn't have blinked twice if you had told me someone's nonna had been making these meatballs the same way since she was a small girl in the Italian countryside. De La Torre's most impressive dishes had this seamless quality, wherein all the chef-y fine-dining techniques stayed hidden below the surface, contributing flavor and texture without calling attention to themselves. It's not surprising that De La Torre's résumé includes stints at well-regarded Italian restaurants Nopa and Quince (both in San Francisco) and also an eight-month apprenticeship at the Oakland fine-dining temple Commis. In any case, it's lucky that my meals all took place during the winter because is there any other foodstuff known to humankind more comforting in cold weather than rustic Italian cuisine? Apart from those meatballs, the other big highlight was a hunk of braised beef cheek (a half-cheek, at least) that had been cooked for some five hours until it was gorgeously jiggly and tender enough to eat with a spoon. This was served over a mound of soft, creamy polenta, in the proper Italian way, but also with shishito pepper emulsion that added a smokiness and a tangy heat that veered the dish toward Mexico, like a deconstructed cabeza taco. In general, the dishes at Blackwater Station tend to feature big, bold flavors that kind of punch you in the face at first bite — or at least grab you by the collar and give you a good shake. 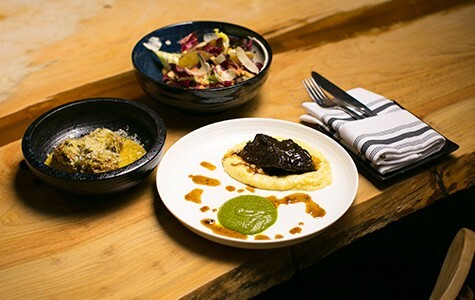 De La Torre explained that because the format of the menu lends itself to sharing, he figures he needs to make an impression in the first bite or two. (I should note here, however, that the portion sizes are reasonable for this kind of place.) It's easy for this kind of "go big or go home" cooking philosophy to go terribly awry, but De La Torre mostly succeeds in creating dishes that are bold but still well balanced. 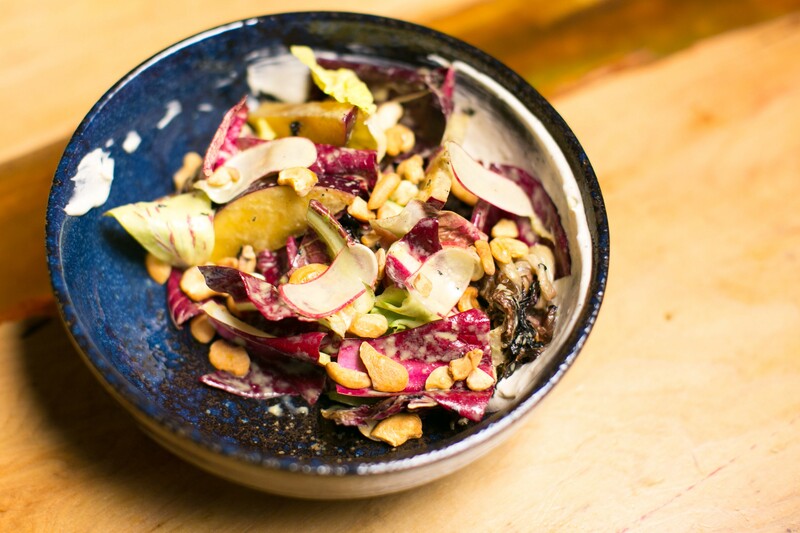 In a chicory salad, he tempers the characteristic bitterness of the green by grilling a portion of them until nicely charred, and by adding counterbalancing sweet (apple) and salty and pungent (anchovy) elements — the latter being the brashest and most insistent note, and the one that kept me coming back for more. Other vegetable-centric dishes were similarly plucky. Toasted soffritto bread crumbs gave a plate of grilled broccolini a flavor boost, as did a grayish purée made from pine nuts and the hard ends of the broccolini, which often just get thrown away — a clever bit of thrifty "whole vegetable" cooking that for whatever reason struck me as perverse: poor broccolini dismembered and served in a sauce of itself. An oyster mushroom and farro dish was spiked with a deliciously soppable black garlic olive oil, though the mushroom portion was too skimpy for the dish to rank among my favorites. 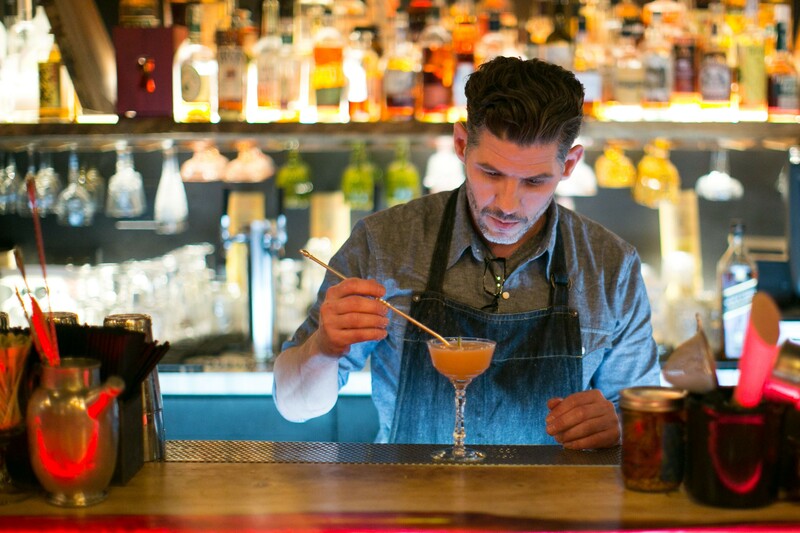 For much of the menu, De La Torre leans on his background in Italian cooking, making his own pasta in-house, for instance — surely a rare feature for a cocktail bar. But mostly Blackwater Station proudly takes up the mantle of New American cooking that many of today's Bay Area restaurants practice, even if they eschew the label — for fear of seeming too fusion-y or not ingredient-centric enough, I suppose. And that was one of the things I liked about the food at Blackwater Station — how the fried chicken, for instance, was like a cross between Japanese karaage and buttermilk-marinated fried chicken popular in the American South. The boneless thighs were hot and moist, but had a craggy crust and were served with a side of sweet bread-and-butter pickle slices. Dessert was a scoop of cardamom-and-coconut ice cream topped with a cilantro-yogurt purée and a scattering of sesame seeds. For all intents and purposes, it could just as easily have come from an upscale Indian restaurant. Of course, Blackwater Station is hardly the only bar in Oakland that's serving food of this quality. That's one of the hallmarks of our upstart dining scene. Still, after all the conceptual tweaks, it was nice to see the place full late on a Tuesday night, mostly with couples grabbing drinks and sharing a plate of food or two. Here's to hoping this latest version will stick around for a while.